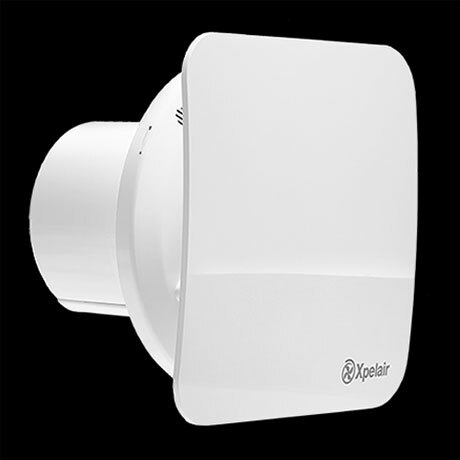 The Xpelair C4TS Simply Silent 4" Square Bathroom Extractor Fan with timer which continues to work after the fan is switched off. The timer is adjustable at installation. The Simple Silent Contour range has revolutionary Ghost air movement technology, making this Extractor Fan the quietest intermittent bathroom fan on the market. The small and sleek design of the contour is accompanied by easy installation to offer a hassle free setup, suitable for a wide variety of fittings such as walls, ceilings and panels. This new range comes with two choices in speed from 15l/s to 21l/s which are selectable at install to provide the most effective control of humidity and odours in bathrooms, shower rooms, cloakrooms and toilets.